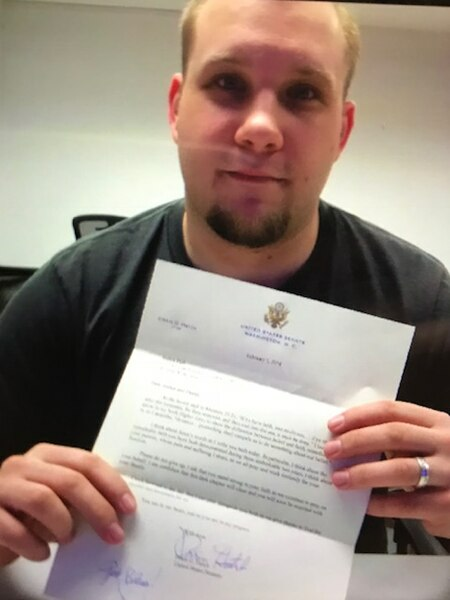 (Photo courtesy of Sen. Orrin Hatch) Josh Holt holds a letter from Utah Republican Sen. Orrin Hatch, delivered by personnel from the U.S. Embassy on Friday, Feb. 9, 2018. The letter is meant to encourage Holt and assure him that the politician is continuing to fight for his release from a Venezuelan prison, where he's been held for a year and a half. Caracas, Venezuela • A powerful U.S. senator traveled to Venezuela on Wednesday as pressure mounted on President Nicolas Maduro to hand over a Utah man jailed in the turbulent South American country for nearly two years. The Senate’s No. 2 Democrat is also expected to meet with Maduro to discuss the imprisonment of Joshua Holt, who is being held in a Caracas prison along with several top government opponents while awaiting a trial on what the U.S. has called trumped-up weapons charges. Durbin’s visit follows weeks of backchannel talks over Holt between representatives of the two countries in Caracas and Washington. Holt, 25, traveled to Venezuela in June 2016 to marry a fellow Mormon he met online practicing his Spanish. The couple were arrested during a police raid on the housing complex where she had lived. U.S. officials have repeatedly demanded Holt’s release on humanitarian grounds, considering the charges against him and his wife, Thamara Candelo, to be politically motivated. Maduro is expected to win a second term as president in a May 20 election that the U.S. and Venezuela’s largest opposition parties have rejected as being rigged in his favor, leaving the South American leader few if any allies in Washington from either political party. Durbin played a key role in Cuba’s 2014 release of American Alan Gross, who was held in prison for five years on the communist island. The Associated Press first reported behind-the-scenes dialogue to win Holt’s freedom. Caleb McCarry, a top Republican congressional staffer who has known Maduro for 15 years, traveled to Caracas in February to meet with the Venezuelan leader and first lady Cilia Flores to press for Holt’s release. That dialogue prompted a visit to Washington by a trusted ally of Maduro, Gov. Rafael Lacava of Carabobo state, to discuss Holt with lawmakers.